This really is not as offensive at it first appears to be – give it a minute. I was inspired to do this piece in October of last year as I became increasingly irritated by the political commercials with the message of “he can’t save you, I can save you”….. “no, HE won’t save you, I will save you!”…and back and forth and back and forth until I didn’t even care who won the election I just wanted it to be over! It got me to thinking about who, as a society, we look to… for salvation. Who is it that we worship? Is it really WWJD or WWJDD (What would Johnny Depp do)??? Who do we listen to, who do we want to emulate? I used digital prints for the heads of these figures to add to the sense of impermanence these figures have in our lives. We so quickly replace the idols we worship, no one would ever have a permanent seat at this table. As easily as we add a “God”, we discard another – yesterdays news, so to speak. 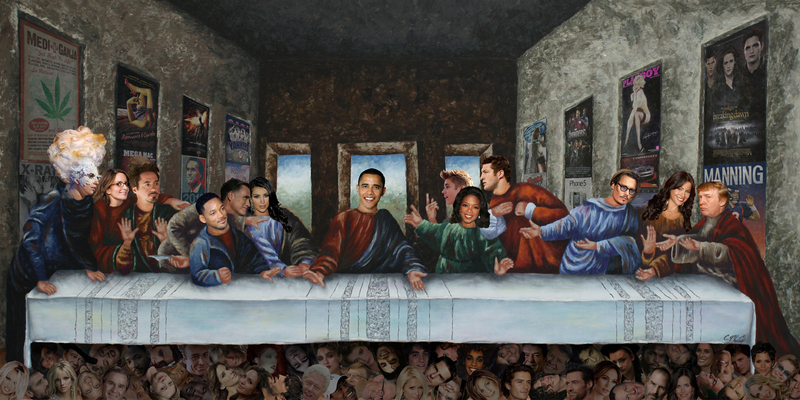 This painting for example is already out of date, Romney must take his place with the other has-beens on the floor and maybe we should add in his place … I don’t know…….. who do YOU worship??? February 4, 2013 in Paintings. I love this painting because of the representation and meaning behind it. It takes how we think of the “idols” or important topics in the media or society and relates to the same level as religion. It sums up the way we “worship” those in the media and how they are always being switched out for someone new. I also think it’s an awesome way to demonstrate how we as a society are so unroyal to those we worship that they are all interchangeable.